Page title: Should Scientists Be Marching for Science? Should Scientists Be Marching for Science? Michelle Pucci is a producer at CBC North in Iqaluit and a former Chawkers editorial fellow at The Walrus. On July 10, 2012, pallbearers in lab coats carried a black coffin up Parliament Hill behind a cloaked reaper and proclaimed the death of evidence. 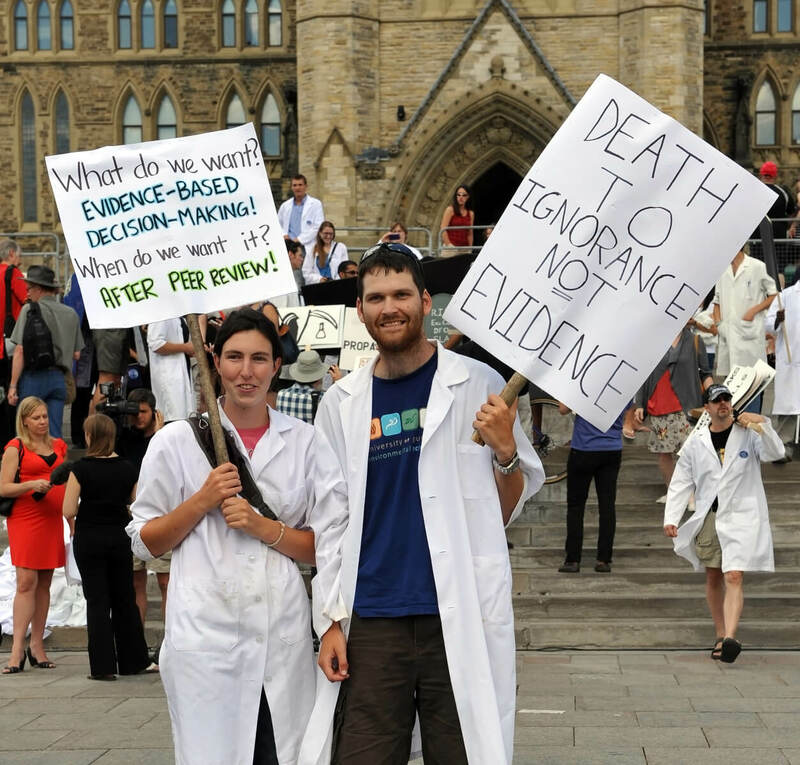 The procession of 2,000 scientists mourned the cuts to internationally renowned research centres and the muzzling of scientists by Stephen Harper’s Conservative government. When they reached the Canadian Parliament building, participants tossed Darwin’s The Origin of Species and other books into the open casket. When Canadian scientists criticized the loss of programs supporting field research and public communication, their US counterparts joined in. The march planned for today in DC is greater than the rallies hosted on Canada’s government lawn, but the underlying motive is the same: science appears to be in trouble. The March for Science follows the globally synchronized protests for women, immigrants, and detained foreign travellers in the aftermath of the Donald Trump’s election. Yet this particular movement has struggled to find its mandate, originally telling the New York Times “it’s not a political protest,” and then drafting a comprehensive mission statement and clearly stating “we are political.” Amid the confusion, some have questioned whether scientists belong on the front lines of political action—or if they should be involved at all. Those in favour of the March for Science say the debate is a problem of semantics: political involvement differs from partisan support. “Some scientists think there is such a thing as neutrality and objectivity in science, and it becomes problematic when you become politically involved,” says Margrit Eichler, president of the Canadian science advocacy group Our Right to Know. “They fail to see that they have an obligation to be engaged and to make the knowledge available.” Independence and funding for US and multinational projects are at stake whether researchers participate or not, and the most recent election hasn’t changed the reality that scientists are always having to justify their work’s value to society. The challenge now is reminding political leaders the science-based policy differentiates fact and fiction. Human-caused climate change? Fact. Vaccinations linked to chronic illness and autism? Alternative fact. And while evidence is supposed to be ideologically neutral, the source of funding for research and the restrictions fixed to the money is entirely dependent on politicians and the policies they champion. Eichler says researchers need to do a better job of informing taxpayers—the source of a majority of government funding—where their money goes. Perceived public fatigue or disinterest in science allows governments to slash the budget—or worse. Under Prime Minister Stephen Harper, for example, agencies prohibited government-funded scientists from talking about their research, and data centres were shuttered. In the US, it’s rumoured that the White House has been removing information about climate change from the Environment Protection Agency website. The administration is also suggesting an 18 percent cut to the National Institutes for Health (NIH), which is the primary US health research agency and a global leader in medical innovation, unless Congress can be swayed. At a Toronto sign-making event ahead of the march, Dan Weaver stands in front of a curtained stage in the main hall of the Tranzac Club to defend the idea that scientists should get political. Weaver, an atmospheric researcher, was studying the Arctic when the federal government announced it wouldn’t renew funding to support the Polar Environment Atmospheric Research Laboratory (PEARL) on Ellesmere Island. The lab contains data about changes to the Arctic atmosphere that are crucial in climate change research: In 2011, a year before funding cuts were announced, PEARL had reported massive ozone depletion in the Arctic. Closing the lab, Weaver says, would have left a hole in Arctic climate data. Without government funding, the station couldn’t afford to keep experiments running during the summer of 2012—despite citizen efforts to raise $10,000—leaving a hole in PEARL’s data for that period until a five-year grant restored most of its funding. Sharon Cohen is also prepared to march. Cohen, the director of a Toronto Alzheimer’s and dementia research centre, speaks with urgency about the potential cuts to health research in the US. The NIH is a dominant force in Alzheimer’s research, thanks in part to a bill signed under Obama’s administration. Rolling back efforts to combat the disease won’t meet the rising demand for treatment, which is climbing as the elderly survive other diseases and live longer around the world. Globally, the number of cases is expected to triple by 2050 to 115 million. Politicians agree something needs to be done: Obama’s national strategy to eliminate Alzheimer’s by 2025 met little objection when it was approved, though negotiations by a fractious Congress on how much money should be dedicated to research has stalled the plan. “If we allow myths to be perpetuated and allow neurological research to be underfunded, it’ll totally backfire,” Cohen says. Canada currently has about 564,000 Alzheimer’s patients, which is poised to double in the next twenty years and cost Canadians upward of $17 billion. “We can’t really afford not to find effective treatment,” Cohen says. There isn’t a shortcut to finding new treatments or cures. But if the public rallies around Alzheimer’s the way it did for heart and lung diseases, then it won’t be such a long shot. The solution to preventing attacks on scientific agencies may be to not only march, but also run for office. In the US, the 314 Action group, inspired by the first digits of the constant pi, is raising money to train scientists to become politicians. The US also has advisory and lobby groups like the American Association for the Advancement of Science (AAAS) advocating for science in politics.